The Fukushima Nuclear Power Plant is leaking radiation into the ocean killing all marine life. If unchecked, the radiation will reach the shores of the USA. In the Barracuda trilogy’s captivating final installment, NYPD detective Mick O’Shaughnessy reunites with familiar faces to chase down Yakuza gangsters looting priceless Japanese artifacts. After a powerful earthquake strikes the coast of Japan, the whole region is on the brink of ecological collapse. Not only did the quake prompt a deadly tsunami, killing thousands, it also laid waste to the Fukushima nuclear power plant, currently spilling its radioactive innards into the surrounding waters. As local citizens are distracted by the disaster, the Yakuza begin stealing ancient antiquities from local museums—precious pieces of history worth millions on the black market. Fortunately, Dr. Tim Collins and James Donaghey are called into to stop an environmental catastrophe in process, while Micko joins FBI agent Buddy Burger to end the Yakuza thefts. But a hidden danger is lurking underneath the water—one that could make their jobs more difficult than they ever imagined. Mike Monahan is a retired detective for the New York Police Department who served in the South Bronx for twenty years. He is also an avid scuba diver, and a certified dive master with the Professional Association of Diving Instructors, who has completed more than a thousand dives at shipwrecks all over the world. 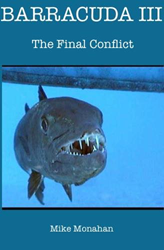 In his Barracuda trilogy of novels, Monahan draws upon his experiences as both an NYPD detective and an undersea explorer in unique and thrilling ways. Monahan lives in New York City.